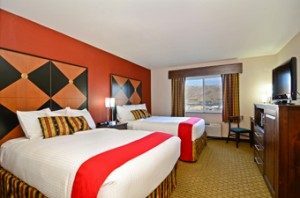 Enjoy a comfortable sleep with cozy pillows and mattress and feel like you are in your own house and enjoy your favorite TV shows on 32-Inch LCD TV. Watch your favorite show online or browse the internet with a complementary super-fast internet connection. Make your style sandwich and have some cool drinks from the mini fridge, iron your clothes or just sit and relax while enjoying the view. With our services, you will feel like you are at home and enjoy with your family or friends. Need something? Just ask the innkeeper at the front desk. 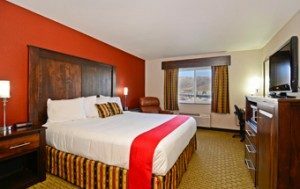 At Inn America, we believe your comfort is our primary business. "Your comfort is our business at Inn America." Large and high-quality king bed with a dark wood headboard is ready to offer heaven like comfort. Keep yourself entertained with free Wi-Fi. Enjoy all the premium channels on a 32-inch LCD TV. Inside the room, there will be amenities like coffee or tea maker, microwave, refrigerator, telephone and free local calling. You will also get a hair dryer and complimentary toiletry. Our 24x7 hour housekeeping service will keep your room’s environment comfortable and clean. If you love smoking, you can do it in a smoking room without any hesitation. Best for families and big groups as the air-conditioned non-smoking rooms offer one king bed and two double beds. Stay connected with everyone and checks your social media profiles through complementary Wi-Fi. No need to worry about worry about the entertainment as you will get access to all premium channels. Additional amenities include a microwave, coffee/tea maker, and mini refrigerator, telephone with the unlimited local call, basic toiletries and hairdryer. Regular housekeeping will keep your room clean.